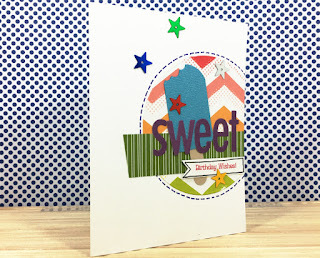 Fairy Cardmaker: Sweet, Summery birthday cards! I hosted a Stampin' Up! party in January and we did a card swap. In a swap, each participant makes multiples of 1 card design. You pass yours out to other guests and get their design in exchange. For my card, I decided to use scraps. I die cut some circles from rainbow chevron paper and offset them over the side of the card. Then I dug through my stash for some metallic strips and put them through my 2.5 inch circle punch. I pulled the end through the punch so I would punch only one end to get the curved side. Then I used my scalloped circle punch to take a "bite" out of it. A little more digging through my scraps yielded some strips to ground my sentiment. Then I sprinkled some star sequins on it. The Popsicle stick is the Word Window punch from Stampin' Up! (now discontinued), but you could make it the same way I made the Popsicle - just use a smaller circle punch! I made some chocolate ones too, of course! It was really quick to put these together (except if I used the glitter brush - they take a while to dry!). I think they turned out fun and cheery!